Mandala colouring is an enjoyable pastime, but its benefits go far beyond having fun. Colouring intricate designs demands mental focus and concentration, similar to the concentration you can develop during meditation. 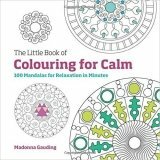 This collection of 100 designs by respected expert Madonna Gauding will help you to you to silence your mental chatter, achieving a kind of mindfulness that will leave you refreshed, calm and focused.